Spirituality in the face of chaos informs the 10th studio set from Brit-rock institution. 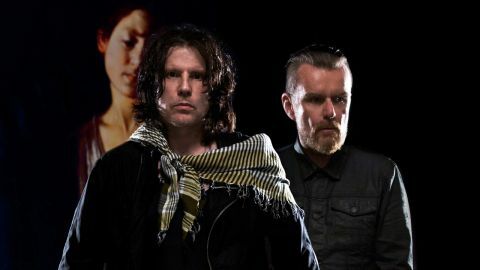 Towards the end of The Cult’s set at the Coachella festival in 2014, Ian Astbury began singing, ‘We built this motherfucking city,’ repeatedly over the iconic intro riff to She Sells Sanctuary. This spontaneous refrain was The Cult frontman’s oblique way of reminding the assembled hipsters that not only had he helped reignite the cross-genre US music festival – his 1990 A Gathering Of The Tribes festival inspiring Perry Farrell’s Lollapalooza concept – but that, thanks to the success of 1985’s Love album, his band were one of the key players in the birth of the ‘Alternative Nation’. Whether anyone in the audience understood the message is debatable, but his point – that The Cult deserve a little R.E.S.P.E.C.T. – is a fair one. At times the band have been their own worst enemies, with Astbury inviting all manner of ridicule for his ludicrous transformation from Bradford squat-punk to Native American shaman. But their catalogue has (largely) stood the test of time and they remain a fabulously capable unit in their fourth decade, as Hidden City admirably proves. The group’s fifth collaboration with super-producer Bob Rock, who first came on board for 1989’s Sonic Temple, Hidden City sounds fantastic, each instrument given ample space to breathe, and across its 12 tracks, the quality of Astbury and guitarist Billy Duffy’s songwriting shines. With its title inspired by Argentinian footballer Carlos Tevez – the former Manchester City striker repping his home-town ’hood by displaying the words ‘Ciudad Oculta’ (Spanish for Hidden City) beneath his team colours whenever he scored – the album is billed as Astbury’s searching quest for spirituality amid the chaos of modern existence. But really it’s Duffy who turns in a man-of-the-match performance. From the punchy, swinging Gretsch Falcon open chords which introduce opener Dark Energy through to the seductive Hinterland and on to the sinewy Zeppelin-esque riffs underpinning GOAT – wherein Astbury salutes the ‘Greatest Of All Time’ – Duffy’s playing is a masterclass of economy, phrasing and power, and a brilliant foil for his long-time pal’s more grandiose melodic flights. In a different musical climate, the driving No Love Lost, the U2-aping Dance The Night and the beautiful Birds Of Paradise would all be hit singles, but even if The Cult’s commercial heyday is firmly in their rear-view mirror, album number ten is a reminder that they’re gracefully assuming ‘national treasure’ status.